Ever wondered if you had an option to invest in something other than Bank Fixed Deposits, but not involve much risk like stocks, Mutual Funds, etc? Well there are actually a few alternative options to FDs in India. Just like Bank Fixed Deposits, various companies or corporates like Godrej, Tata, Mahindra, Reliance, HDFC (not their Banking division) etc., offer Fixed Deposits or FDs for the general public to invest in. The interest is usually on the higher side compared to the Bank FD by usually 1 to 3%. They even have the flexibility of tenure. A lot of the Corporate FDs provide a tenure as less as 6 months to as high as 5 years. There are also similar options to distribute interest just like bank FDs; monthly, quarterly, half-yearly or annually. These are however not entirely secured as the Bank FDs, and hence one should do a thorough check on the fundamentals, past performance and general financial position of the company before investing in their corporate FDs. If the company has a sound business model than your money should be safe and you will get good returns over your FDs. This is among the better known options to Fixed Deposits in India. However their returns are at times equal or only slightly higher than FDs and hence a lot of people do not consider it. Also the longer lock-in periods and not so user-friendly investment procedure deters people from considering them as an alternate to FDs in India. 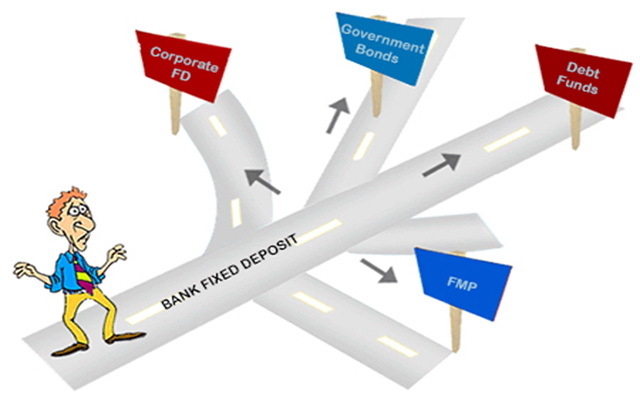 However, if you want to diversify your safe investment portfolio, or the current rate of interest on Government Bond is higher than the bank FD, and you are willing to park your funds for the lock-in period of the bond, you can always consider this as an investment option against Bank FDs in India. Debt Mutual Funds are actually mutual funds that invest in secured instruments like government securities, corporate bonds, money market instruments etc., to assure a certain level of fixed returns. These usually have a fixed maturity date and since they are traded on the markets, there can be appreciation or depreciation in the capital value but by and large this does not result in you losing a lot of money and they will give you equal or slightly higher returns over bank FDs. The other factor in favour of Debt Funds is the liquidity is high since the money invested can be withdrawn just like you would withdraw from any other mutual fund. There however maybe an exit load, depending on the type of fund you opt for, however it is not a big amount. Debt Funds can serve well if you are looking for an alternative option to Fixed Deposits in India. Similar to the Debt Mutual Funds, Fixed Maturity Plans also invest in debt instruments like bonds, securities etc. The only difference being the model on which the two work. Fixed Maturity Plans or FMP invest in those instruments or securities whose maturity coincides with the FMP’s maturity. For instance if an FMP has a maturity of 1 year, it will invest in only those bonds, securities or instruments that too have a maturity of 1 year and hence, avoids the loss of interest or re-investment risks. On the flip side, the liquidity is very low. You can only withdraw from them once they mature, and hence if you want some higher returns over your FDs and opt for FMPs, you can do so as the risks are very low and interest can be higher. But just keep this one thing in mind, opt for a tenure that you are comfortable with blocking your funds because you won’t be able to withdraw mid-way as FMPs are close-ended funds. The above are the various options that are relatively safe and assure you fixed returns on investment at varied tenures. You can surely opt for any of them after going through past performance and returns they have yielded to choose which one you can invest your money in as an alternative option to fixed deposits in India.